BeeDome made with #BeagleBoneBlack @TXInstruments @beagleboardorg « Adafruit Industries – Makers, hackers, artists, designers and engineers! ForestDew Apiaries, located in Ottawa, Ontario, has been keeping, testing and trying 20 strains of bees from all over the world for 13 years. They pride themselves on coming up with innovative products and solutions in the bee industry, and their BeeDome is definitely one of these solutions. The BeeDome is a system to control the environment of indoor nucleus colonies (nucs) where small honey bees are kept indoors over the winter months. The BeeDome extends the bee breading season so ForestDew can offer strong, healthy nucs to beekeepers early in the spring at reasonable prices to replace bees lost over winter. This is especially important in northern climates where winter creeps in early. After more than five years of research and prototyping, ForestDew Aparies is now live trialing the BeeDome. 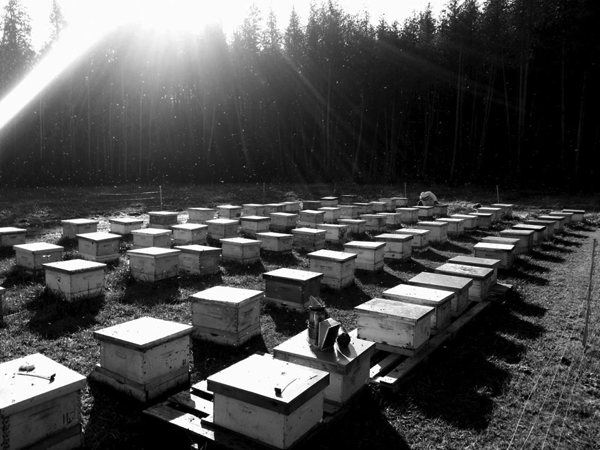 ForestDew Apiaries puts its nucs into the BeeDome in later November for the winter, where they are kept in environmental conditions that ensure minimal food store consumption. ForestDew Apiaries credits the BeeDome for helping it deliver reasonable priced, quality bees to its customers. The BeeDome is a computerized system based on the Sitara-processor-powered BeagleBone Black computer as well as a specially designed “cape” plug-in board. BeagleBone Black is connected to the Internet, and stats are uploaded periodically to a website so that the company can closely monitor the nucs. The BeeDome also integrates GE Telaire T6613/T6615 and MG811 sensors to monitor the CO2 level; DS18B20 sensors to monitor temperature; DH22 sensors to monitor humidity and temperature; and Sharp COM-10636 SSR devices to control 120V devices.